What’s Wrong With Xcel’s Proposed Community Solar Program? Fees and illegal caps, for starters. After the state’s solar energy law passed in 2013, Minnesota’s largest electric utility, Xcel Energy, was required to create a program to support the development of community solar energy. Since 3 in 4 people can’t have solar on their own rooftop (because they rent, or have a nice shade tree), community solar dramatically expands the opportunity for the average person to reduce their energy bill and participate in a clean energy future. Xcel Energy published their proposed community solar program on Sept. 30, 2013 and I’ve got a few choice words about their proposal, in response to questions posed by the state Public Utilities Commission. Does Xcel’s proposed plan for operating a community solar garden (CSG) meet all the program design requirements, as well as the terms and conditions in Minn. Stat. §216B.1641? No. The 20 MW limit under the proposed plan is clearly against the spirit and letter of the law which requires there to be no limit on the amount of capacity allowed under the community solar program. Furthermore, even a short-term limit on community solar installations could put them at an economic disadvantage. In the two years they propose limiting community solar, other solar projects will be rushing to interconnect while the utility still needs solar capacity and while the federal 30% tax credit is still available (through December 2016). Xcel has also clearly indicated an interest (in its filing) in developing utility-scale solar projects (often 20 MW and larger) that may quickly consume available capacity under the solar standard, lessening the value of solar renewable energy certificates (RECs). In 2012, three U.S. states installed more than 400 MW of solar in that year alone. Seven states installed at least 100 MW of solar energy. Community solar should be allowed to grow as much as the market can bear while the solar RECs still have a high value to the utility. Prior to the establishment of a Value of Solar rate, what should solar subscribers be paid for their energy and transfer of renewable energy credits (RECs)? The interim rate should mimic other community net metering policies by reimbursing the customer (in dollars) for their kilowatt-hour production times the retail rate they pay for energy. If Xcel wishes to offer producers an option to sign a long-term purchase contract for energy (similar to the value of solar tariff), it should reflect the expected present value of the payments that would be received under the above rate, and at a comparable low-risk interest rate for the contract life (e.g. U.S. Treasuries). 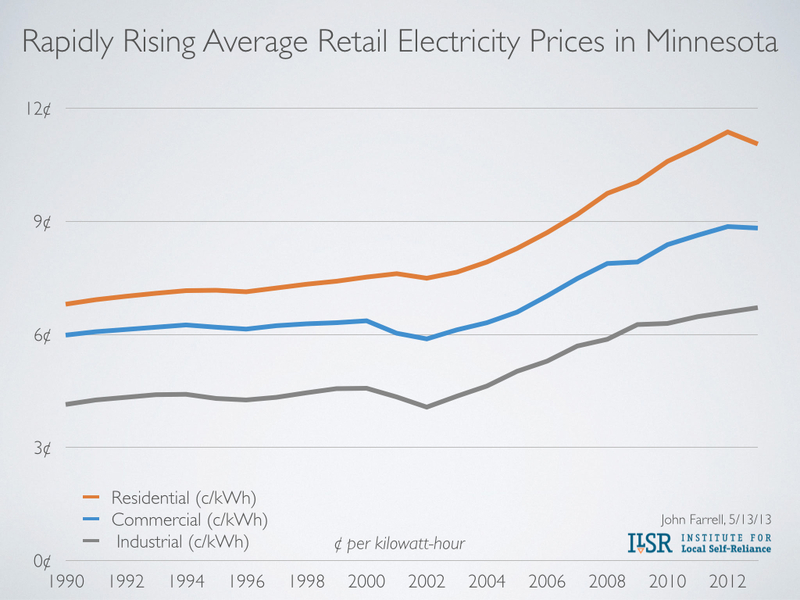 Xcel’s retail electricity rates have risen nearly 40% in the past decade and the utility has announced its intention to increase rates in each of the next four years. If allowed to compel community solar subscribers to accept a long-term, flat rate payment, Xcel would put them at a severe disadvantage to traditional net metering customers, an unlikely legislative intent. Transfer of RECs should follow existing state policy. Under net metering, Xcel does not retain ownership of the renewable energy credits. Despite significant revisions to the net metering statute by the 2013 legislature, the lack of change indicates intent to maintain this policy, even as the legislature clearly intended the REC to transfer under a value of solar tariff. Furthermore, the value of solar tariff has a clearly outlined methodology for allowing the solar energy producer to capture the full value of their solar energy, including the REC. The net metering policy does not similarly reflect a utility payment for the REC. Is the implementation schedule for the CSG program included in Xcel’s plan reasonable and consistent with the public interest? As mentioned previously and in direct contradiction to the utility’s claim, the two-year program cap is no different from a total program cap, clearly prohibited by state law. An artificial cap on the community solar program puts it at a competitive disadvantage to other forms of solar ownership, including utility-owned solar energy, because REC values may be depressed within two years. The cap on community solar may also act to increase the cost of solar energy acquired by community solar projects. The 30% federal tax credit expires in December 2016. It is in the financial interest of Xcel ratepayers to maximize the amount of solar energy projects receiving this incentive. But the cap on community solar projects through 2015 will leave little time to capture the incentive if there’s far more demand than Xcel’s unlawful cap allows. The proposed two-year cap on community solar projects may also increase the risk to subscribers by encouraging overly hasty development. With an artificial and very limited capacity available, community solar developers will hasten to get their projects in the queue before the quarterly or annual cap is met. This haste could lead to poorly planned projects. Is Xcel’s proposal for an application and approval process reasonable? First-come, first-served application deadlines favor larger solar developers who have in-house legal and financing expertise with significant experience in utility application processes. With its feed-in tariff program, Los Angeles helped to level the playing field by treating all applications received within a 5-day window equally, and using a lottery to select winning projects. The utility could also use an initial point screening of applications, filtering out applications for projects that lack ownership or lease access to the proposed project location. Ontario goes further, and its point system for standard offer projects gives priority to projects that have a higher portion of local ownership, are owned or sited on public property, or that have a resolution of support from the host municipality. Priority could also be granted for projects that have a greater relative economic development impact, such as those that use financing from Minnesota-based lenders or made in Minnesota solar equipment. Are Xcel’s proposed Consumer Solar Garden Operator deposits and fees fair and reasonable? No. 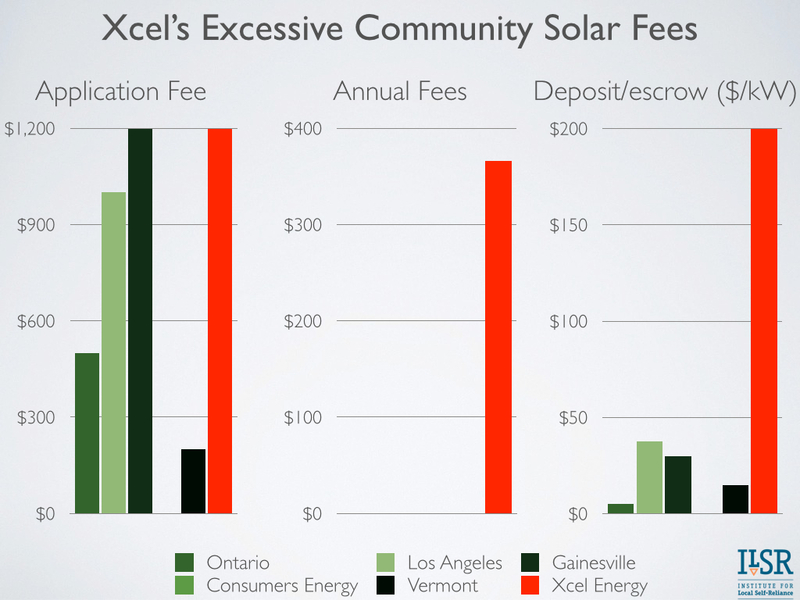 Xcel has more and more expensive application fees than many other comparable programs around the country and the fees are very burdensome especially for small community solar projects. Xcel’s application fee is high compared to other standard offer programs supporting similarly sized projects, especially in the context of its other very high fees. None of the above programs have annual fees or monthly metering fees. Xcel’s proposed fee is unique and expensive, equivalent to a 4% annual tax on production for a 50 kW community solar project. Vermont’s standard offer program ($15 per kW). One must ask whether program fees are necessary at all. Massachusetts, which requires utilities to offer virtual net metering to support community solar projects, treats it no different from traditional net metering. Utilities are forbidden from charging extra fees to net metered projects, community or otherwise. Inexplicably, Xcel says they have no plans to produce a publicly accessible map of capacity on their distribution system. Why not? As shown in the stakeholder discussion on value of solar, location of solar projects can make a difference in its value to the distribution grid, the utility, and ratepayers. Such a map would help direct the development of solar energy projects into areas with existing grid capacity and with low upgrade needs. Xcel could even use the map to direct installations (particularly community solar, which has geographic flexibility) toward areas where the distribution capacity deferral opportunity is the greatest. The Long Island Power Authority is paying solar projects in strategic geographic areas up to 7¢ per kilowatt-hour more for energy. Even if the locational premium is not nearly as high, refusing to help developers produce energy in areas of strategic significance would be a missed opportunity. The legislature’s intent in creating a community solar program was to expand access to generating renewable energy to people who would otherwise not be able to. Xcel’s program cap and excessive fees alone undermine that intent. It’s time for them to go back to the drawing board for a community solar program that works.